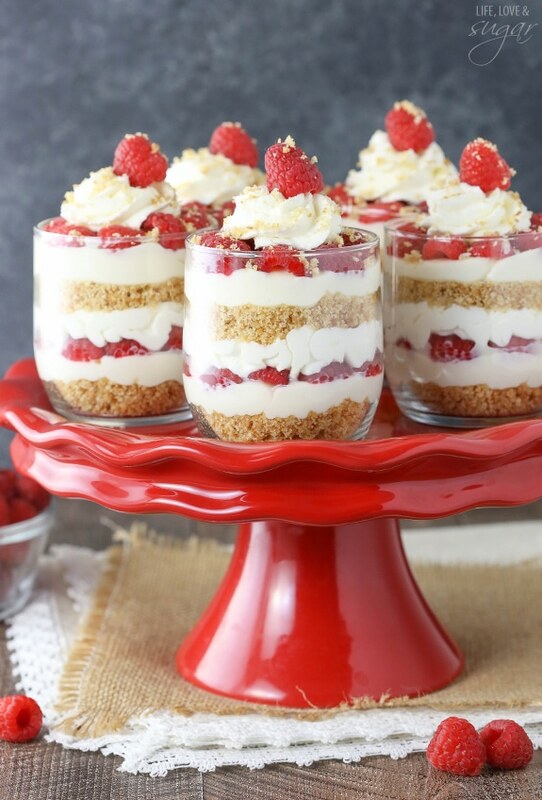 These Raspberry Amaretto Cheesecake Trifles have layers of no bake amaretto cheesecake, whipped cream, fresh raspberries and crushed cookies. Don’t be fooled by their smaller size and simplicity – they pack a ton of flavor and are SO good! 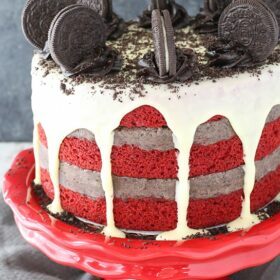 I love desserts like these. Individually portioned, lots of fun layers, and awesome flavors. Plus, no bake and super easy to make. 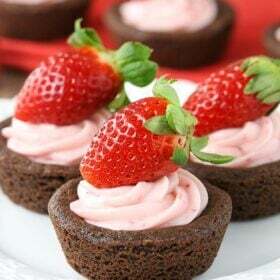 These would be a great treat for Valentine’s Day. If you aren’t very familiar with Amaretto, it’s an almond flavored liqueur. It’s got a great, sweet flavor to it that’s not only tasty to drink, but goes quite well in desserts. It also pairs great with fruit. 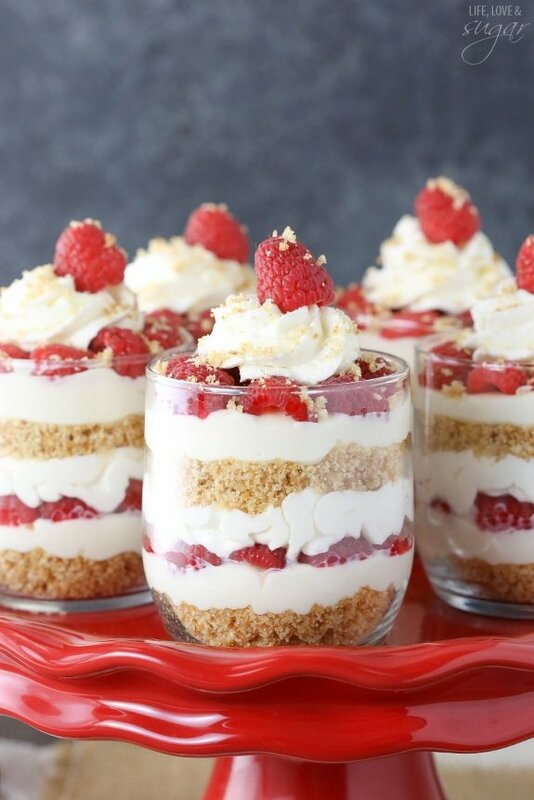 For these trifles, I added it to the no bake cheesecake layers and a little bit to the whipped cream. I totally recommend it, but if you aren’t into alcohol in your desserts you could leave it out and add a little more almond extract. For the cookie layer, I used crushed up vanilla wafers. 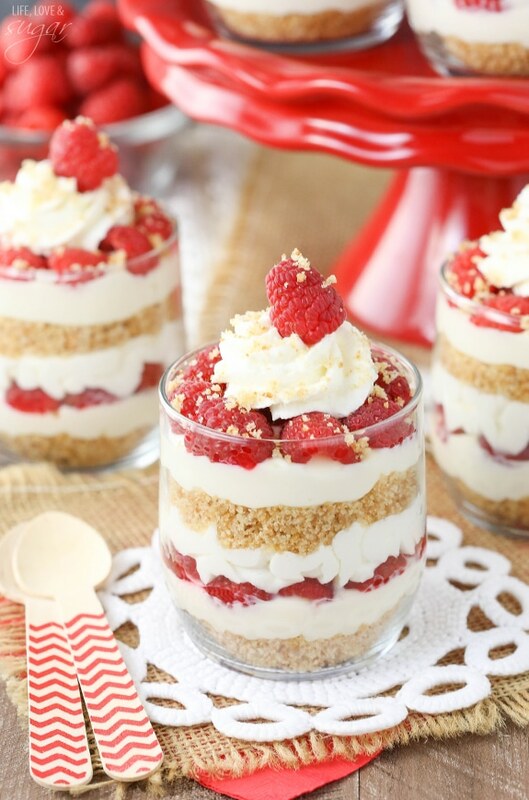 I love to use them as crusts in a baked cheesecake, so I thought they made a great layer in these trifles. When mixed with a little sugar and melted butter, it forms nice crumbles that layer well. Another good option if you’re looking for a substitute would be to use golden Oreos. Love those babies. You can just leave the filling in them and then either reduce or completely leave out the butter. The whipped cream is a nice, stable whipped cream that won’t melt if you refrigerate these and make them ahead. The amount of powdered sugar helps the whipped cream hold form nicely. Obviously my fruit of choice was raspberries. They’ve had really great ones at our grocery store lately, plus the pretty red color is great for certain love-focused holiday. 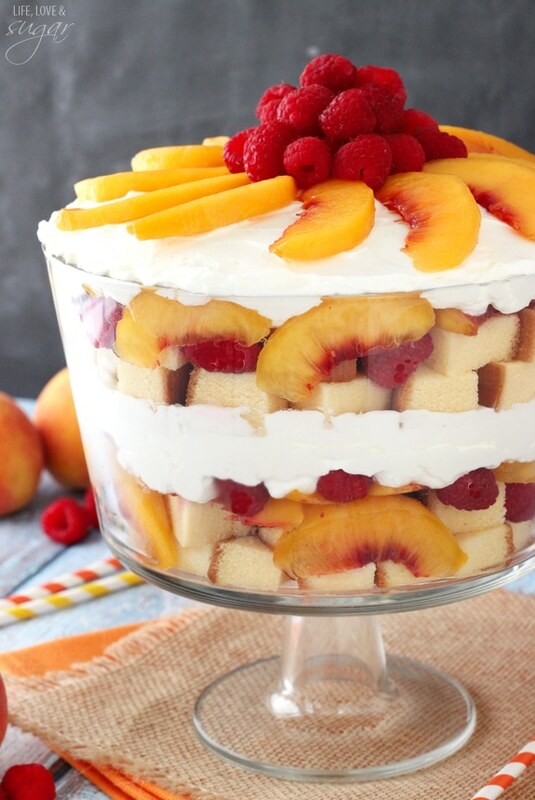 Layer all those great things together and you’ve got a stellar individual trifle. My little cups were 9 ounces, but you could totally use something smaller if you wanted to double up the number of trifles and have smaller portions. I really do love the fruity flavor of these with the almond. Don’t underestimate it – it’s a great combo! 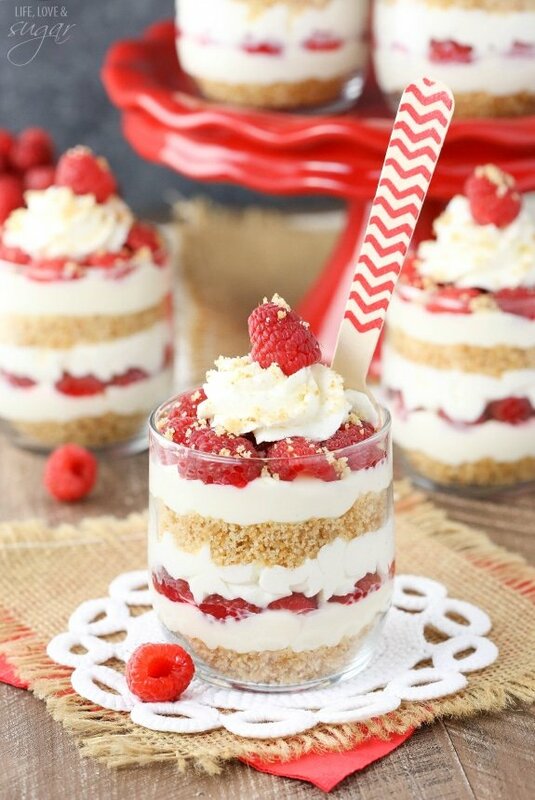 Raspberry Amaretto Cheesecake Trifles have layers of no bake amaretto cheesecake, whipped cream, fresh raspberries & crushed cookies. They’re so GOOD! 1. In a medium sized bowl, combine vanilla cookie crumbs, melted butter and sugar. Set aside. 2. In a mixer bowl, beat cream cheese until smooth. Add powdered sugar, Amaretto liqueur and almond extract and beat until smooth. Set aside. 3. In another mixer bowl, whip heavy whipping cream on high speed until it starts to thicken. Add Amaretto liqueur and powdered sugar, then continue to whip on high speed until stiff peaks form. 4. To add layers to cups, first add about 2 tbsp of the cookie crumble. Next add a layer of the cheesecake. 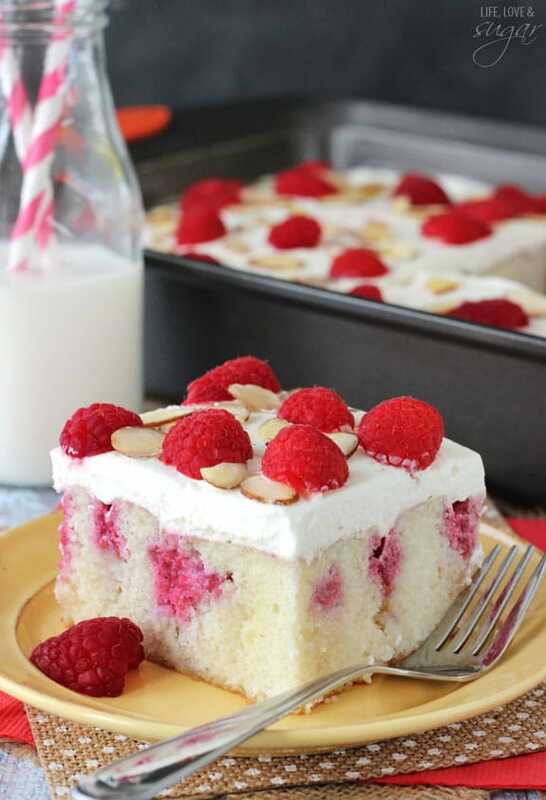 Top the cheesecake with raspberries and whipped cream. 5. Repeat the previous layers one more time. 6. 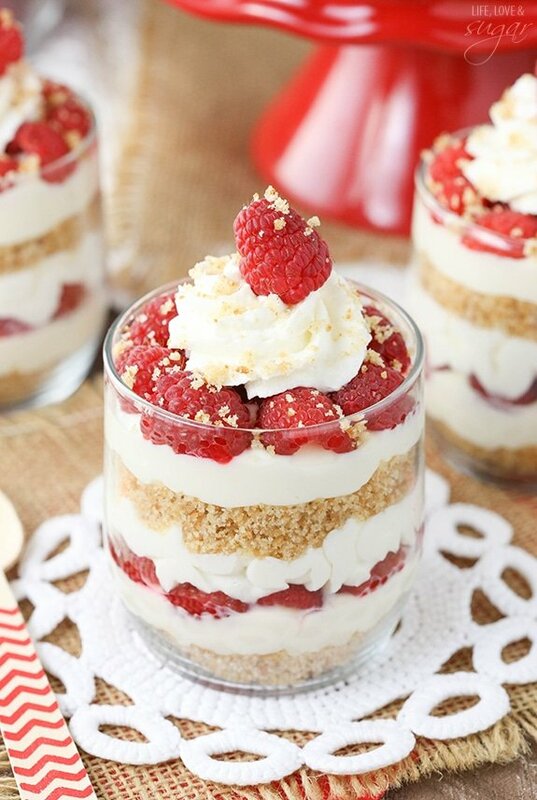 Refrigerate trifles until firm and you’re ready to serve them. 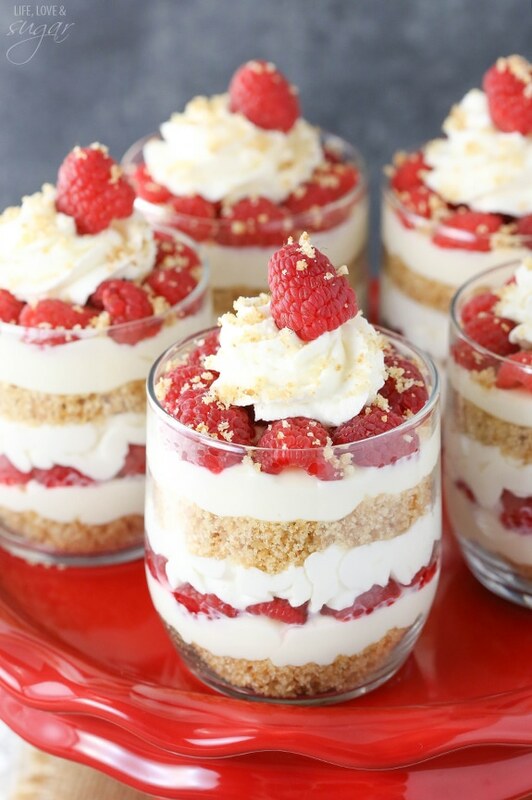 The Raspberry cheesecakes look amazing. Great photography and great display. Beautiful. 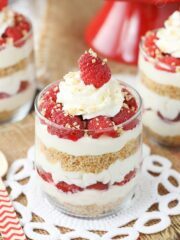 What a beautiful trifle!! 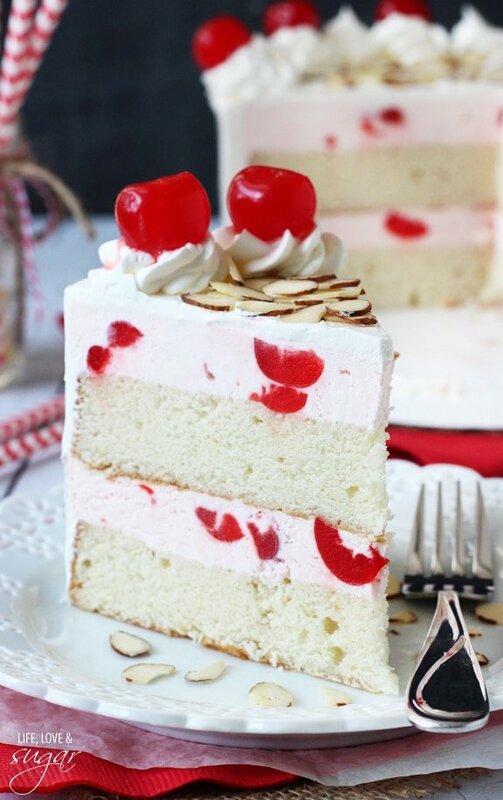 This looks like such a perfect dessert for a bridal shower! Thanks Annie! A bridal shower is a great idea! 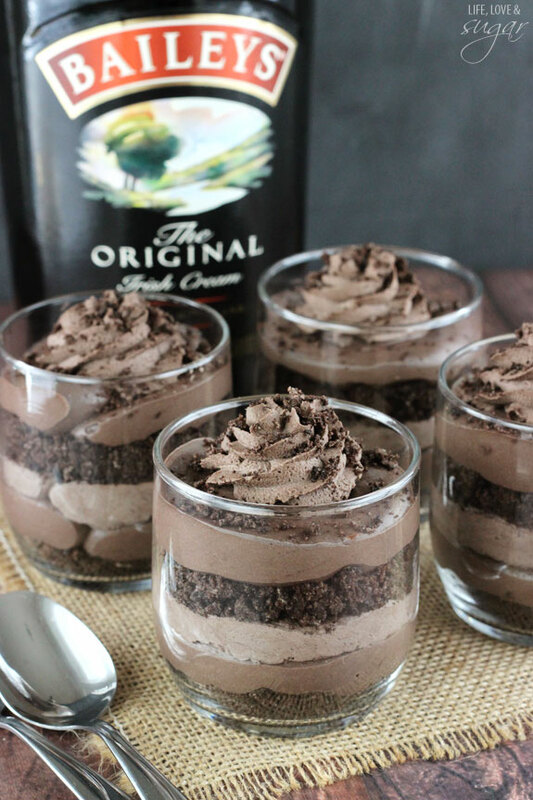 This dessert looks amazing to try but is there a was to substitute the amaretto? If there is that would be great. 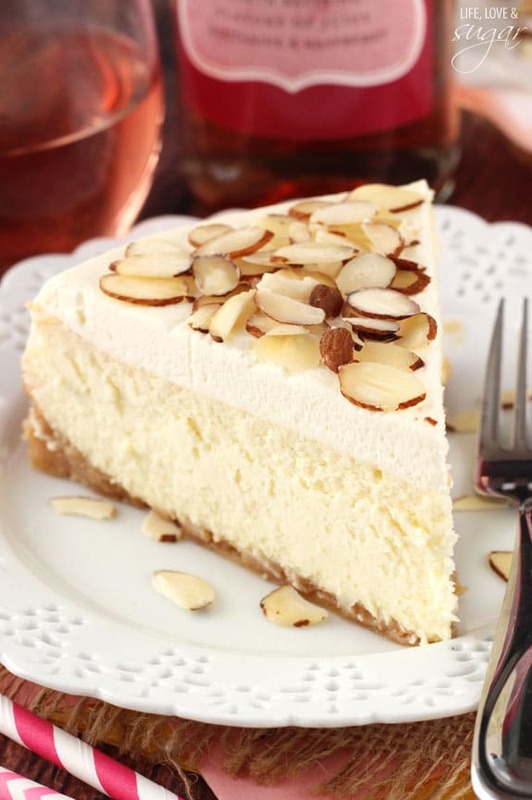 Since the Amaretto is mainly almond flavor, you can just add a little extra almond extract instead.